When I see clients with musculoskeletal issues I often hear them say during a treatment: “Ahhh! That’s really tender! What is that? ?” This is when I perform therapeutic and remedial massage therapy and come across the very common “muscle knot”. A muscle knot is technically called “myofascial trigger point” (TrP): it is a small area of tightly contracted muscle fibers (imagine a muscle cramp but on a much smaller scale). These are so tight that not only they have become “stuck” together but also cut off their own blood supply causing great irritation and muscle dysfunction. Having one myofascial trigger point is bad enough but when we get a number of them in one small area, then it becomes myofascial pain syndrome (MPS). Aggravating factors causing myofascial trigger points can be injuries, insomnia, stress, repetitive strain and awkward working postures to name a few. Some myofascial trigger points are easily dealt with but other can be more persistent and difficult to eliminate. It is natural to wanting to stretch the muscle that has a TrP however this does not help: it certainly feels good but it does not solve the issue, in fact, stretching a tissue with trigger points will only target those fibers in the muscle that are already lengthened without affecting the knot itself. 3. Next apply direct pressure on the knot with your finger – enough pressure that on 1 to 10 scale of pain it would be somewhere between 5 and 7 but not above otherwise you will just tense up and the exercise will not be helpful. Whilst keeping the finger on it, take a deep breath through your nose and into your abdomen, and then exhale and completely relax the area in which the trigger point is located. Eventually within a minute or so you should be able to feel the tenderness easing and possibly a “melting” effect under your finger. Take your time in doing this technique, it is a waiting game! 4. Once the tenderness has reduced, take your finger off the knot and massage the area including the trigger point for 10 seconds and then move the muscle around. Often we find that most of our tender spots are between the shoulder blades and this makes it difficult to reach them with our own hands. You can ask you partner or children to help you but if they are not around, you can easily employ a tennis ball. 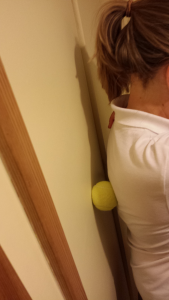 Find a clear wall and lean against it with the tennis ball lodged in between like in the photo. If the weight of your body against the ball does not feel great enough, then move to a hard flooring or rug (soft carpet may be too giving). Start gently: to get rid of myofascial trigger points the “no pain, no gain” rule does not apply!! Of course, if all the above doesn’t seem to work very well and it is not giving you the results you expected, then I will be glad to help you release those nasty knots with remedial treatments! I am available from my home practice in Crawley Down on Mondays, Tuesdays, Fridays and some Saturdays. Please call 07941 711092 or visit www.orangetherapies.co.uk for more information. This entry was posted in Massage, Soft Tissue and tagged MPS, Myofascial, trigger point, TrP on May 31, 2016 by Flik.